Special thanks to Sean McMann of the Poughkeepsie Journal for providing us with a copy of the roster from media day. 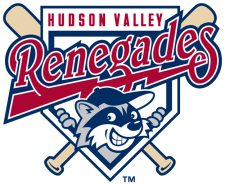 For a deeper look at the Renegades, be sure to read Sean's blog, Renegades Rumblings. Thanks for this. So it looks like Bailey, Malm, and Glaesman will all be going to Princeton. wow looks weak, where are all the top guys from last year's draft. A quick look is 7 Draft picks. There will probably be more with other signings. I'll update with where they came from later, have to go to a meeting now. One guy you haven't heard of is Steve Hiscock. He's a RHP signed as an undrafted free agent out of Rollins College. "Rollins College righthander Steve Hiscock of Naugatuck and Avery Point wasn't drafted but signed with the Rays after the draft. At 7-2 he was Rollins' No. 2 winner behind Tim Griffin, who was drafted by the Mariners." Another new face is Miguel Sierra. He's 6'5" RHP who will turn 22 July 28th. Last year he was in the Cubs organization and pitched for the Boise Hawks in the Northwest League (A-). Is Alex Diaz supposed to start in Princeton? Or would they send him back to the GCL?And no Cody Rogers? I'm a little surprised at how few prospects they're putting on this team. I would have thought at least one of the better draftees from last year would have ended up on HV. I guess that's part of the drawback of carrying a GCL team though. Also, interesting that there's only three listed outfielders, one of whom is really a corner infielder. I did a "slow" count. :) And they had Hubbard's name backwards which probably threw you. Brick, I think there will be additions soon, this is just as of the media day. And remember, some of these guys are gone quickly. Dan April pitched in one game last year and quit. So expect changes in the coming days/weeks. Sorry if this post has crashed or changed back and forth in the past hour. Jim and I were both editing at the same time and bad things happened. It should be stable from here on out. Many thanks to Sean and Jim for getting this. Now all we need are the Princeton Rays, GCL Rays, and XST rosters. Then comes the July 2nd international signing period and late 2010 draft signings. Always something happening. Any guys from the 09 draft I should watch? So I think 5, 2 early rounders, 3 very late guys. All you guys care about is what round people get drafted in. You all know absolutely nothing about baseball. You all think just because the player gets drafted high that hes gonna skip rookie ball. This is the rays organization, I figured youd know how they do things by now but guess not. Last Anon, not sure who or what you're refering to. I posted where they came from last year including 2010 picks and rounds. Michael asked for 2009 picks on the team, so I posted those (think they are all correct, 1st 3 were off the top of my head, had to doublecheck the rounds on Davis and Glynn, but think they are correct). Not understanding the complaint. Was it some of the earlier comments about the "good" prospects not being at HV? If so, I agree. Our top picks were HS players, won't sign early unless unusual situation, lots of options so leverage. HV gets the college and JC guys, Princeton and GCL get HS guys, with a few exceptions. Mix in the international guys, promotions from last year, and you have the rosters. Plus guys continue to sign and quit throughout the summer, so more movement. Sorry if I'm being defensive, but not sure what I don't understand about it, if you even meant it at me. Ask clear questions directed at or quoting what you disagree with and we'll be happy to discuss it. This is a fun time of the year. Enjoy it. Cody Rogers is the big one missing to me. He hit .303/364/.490 at Princeton last year and is 21 years old. He has to be hurt, there's no reason they'd send him BACK to Princeton this year. Cody Rogers has been rehabbing from hip surgery. Didnt we get Sierra from the Rule 5 draft? And asny guesses who may be the starter tonight? FYI milb.com's roster also includes 1B Steven Tinoco, our 34th round pick out of Long Beach State. They sign a free agent catcher, Holloway, who was the 9th leading hitter on his Division II college team. Then they assign him to Hudson Valley. How does that happen? If this is a favor to someone, let him play in GCL. Don't read anything into the catchers. Every minor league team needs many. They need a starter, a backup, bullpen guys, guys to catch off-day sessions, etc. Some overlap, of course, but they still need many guys who can catch. Not every catcher is a prospect. Just because Holloway isn't a great batter means nothing. He's very useful to the gades. Guys like Bailey are being developed for their overall game, not because they can catch in the pen. The actual prospects at catcher are held back typically to develop their overall skills. Good defense/no offense types may be at a higher level, but they fill an different role. Better to be the starter at GCL than the bp guy in HV, basically. Level to age also means a lot less at catcher than other positions, goal is to develop a guy who can handle a staff and have a servicable bat. Takes more time than other positions. You see the same with lefty pitchers too. how's wilmer almonte playing ? or doing his job ?